Some exciting news. My second Paul Dark novel, Free Country, was published by Simon & Schuster in the UK and Canada last year in hardback and trade paperback. On August 18, the mass-market paperback will be published, and while the book itself is exactly the same, the packaging has had a complete overhaul. Firstly, as you can see below, the artwork has changed. And secondly, the book’s title has changed. It will now be called Song Of Treason. This is an unusual occurrence in the world of publishing, but it occasionally happens – here’s an article about it. The reason for it in this case is pretty simple: my publisher felt there was a danger that Free Country might not signal to those who hadn’t read the first book in the series, Free Agent, that it was a spy thriller. I agreed, and tried to come up with a new title that would stand out in bookstores and on websites, and let everyone know what sort of novel they’d be in for. 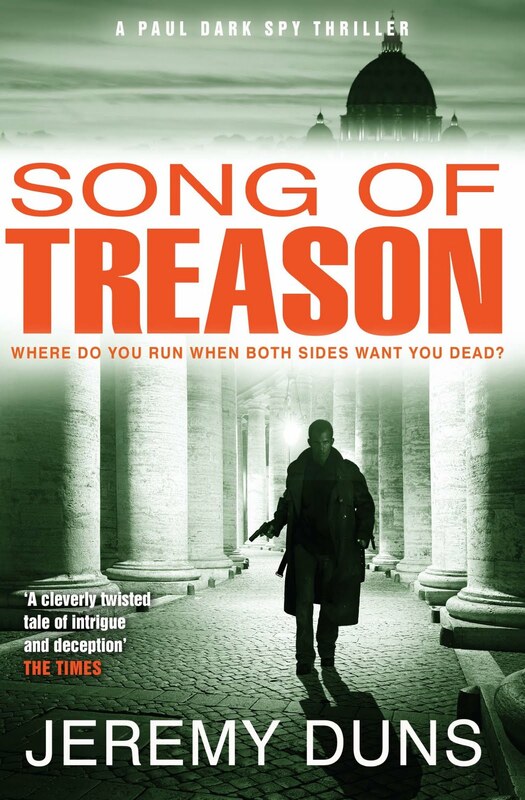 I hope this title does that, and I think the new cover they’ve done for it is fantastically atmospheric, and evokes both the tone of the novel and its Italian setting, which includes this very colonnade in Rome’s Piazza San Pietro. My hat is off, once again, to Rafaela Romaya and the rest of the superb S&S art department. Anyway, I love it – but here, see what you think! Click on it to get a larger version. The book will be published by Penguin in the US next year, although I don’t yet have a date for it – watch this space. It will still be known as Free Country there, and the third book will be titled Free World. In the UK and Canada, Book 3 will be titled The Moscow Option, and it will be out in February 2012 and is already available to pre-order at your nearest online book emporium, with a brief synopsis telling you what to expect. Although the trilogy ends there, Paul Dark does not, as I’ve just signed a new contract with Simon & Schuster and am hard at work on a fourth Dark novel, set in 1971. This continues his story from the first three books, I hope in an unexpected and exciting way. In the meantime, the BBC are continuing to develop the novels as a TV series, and a screenplay is now being written by Timothy Prager (55 Degrees North, Silent Witness, Waking The Dead). Again, please watch this space. And thank you for your continuing support for the books. I don't know what has happened, but for some reason traffic on this blog has increased dramatically recently, and particularly so today. Please check back regularly for more news, or join my new Facebook group, or follow me babbling nonsense on Twitter. I’ll be running some juicy competitions via both in coming months.